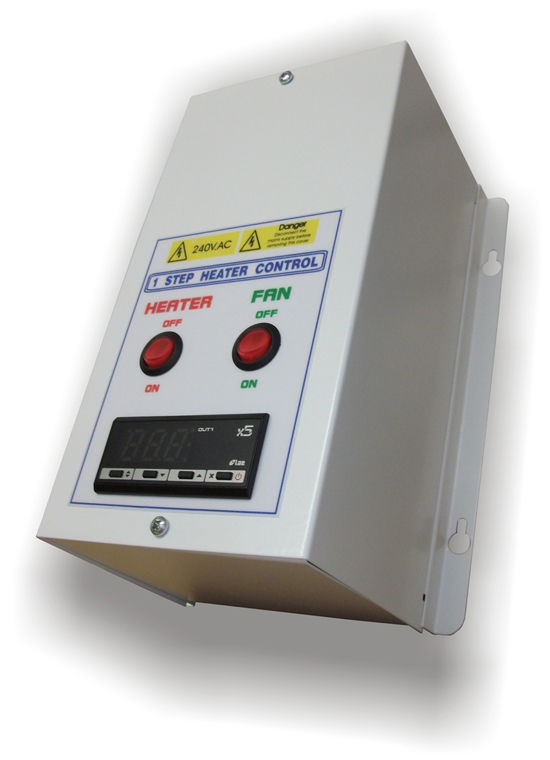 The 1 Step heater control panel is designed to control a single phase fan and a single phase heater up to 3kW. The heater is interlock with the fan and the temperature is controlled by a digital thermostat monitoring a duct sensor. The control panel is designed to give a fast and easy installation. External wiring is kept to a minimum. On site a main supply is connected to the control, then outputs to the fan, heater, safety circuits (heater over temperature, airflow switch) are wired in. The sensor supplied with the panel can be mounted into the extract or return air duct or, if ordered as a room sensor, in the room itself. It should never be positioned near the heater. Switches on the panel then allow control of the fan and heater. The heater is interlocked with the fan circuit and can only run with the fan switched on. All outputs to the fan and each heater element are protected by MCB’s. The whole panel can be controlled via a 7 day time clock to turn on or off in a controlled manner. Have a question about Sarum 1 Step Heater Control Panels? Please fill out the form below and we will get back to you.